LAHORE: (Wednesday, March 7, 2018): An 11-member delegation from Maldives called on Punjab University Vice Chancellor Prof Dr Muhammad Zakria Zakar at University Club here on Wednesday. The delegation consisted of Vice Rector Dr Ali Najeeb, Deputy Vice Chancellor Islamic University Ms. Hawwa Latheef, Department of Higher Education Ms Ummu Salma and others. 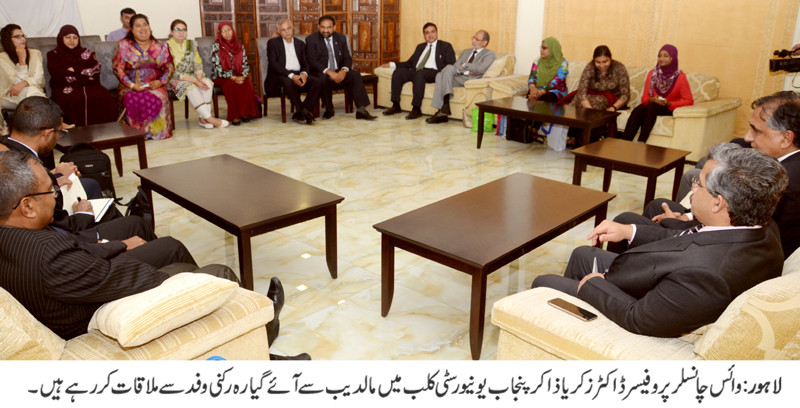 PU deans of faculties, senior faculty and administrative officers were also present on the occasion. The vice chancellor gave a brief introduction about the PU and expressed his resolve to enhance mutual cooperation between the two countries in different academic areas. On the occasion, souvenirs were presented to the delegation. A lunch was also hosted in the honor of the foreign delegates. The delegates thanked PU VC on providing friendly atmosphere to international students with good opportunities of higher learning and stressed the need to promote academic relations between the two countries.